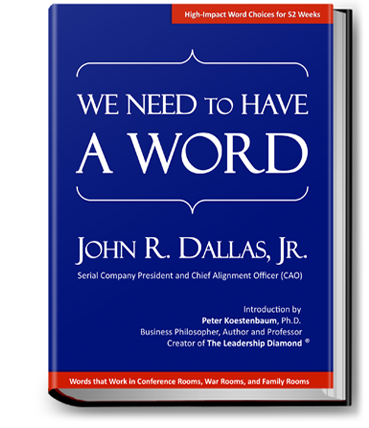 Book - We Need to Have a Word - John R. Dallas, Jr. Welcome! Ordering signed books through this VIP Readers page qualifies you for $10 off the $39.95 retail price per book. Although your book(s) will be shipped twice — from inventory to the author for signature, then from the author to your address — you will only be charged for shipping one of the two packages. We Need to Have a Word is also available online through Amazon, Barnes & Noble, Lulu and other booksellers. Please use the green PayPal button below. In the book's 52 weekly letters to you from author John Dallas, you will enjoy a year-long, week-by-week and word-by-word journey. Reading each chapter is a highly engaging and remarkably personal exploration of untapped potential within 52 key words. You will thrive on John's weekly messages about high-value key words. Reading the 52 chapters will support your decision to meet and exceed your and others' expectations at work, home and everywhere. From board rooms to war rooms, classrooms to locker rooms, dining rooms to family rooms, and in any other venue, this book's 52 powerhouse words will resonate with real-time value. With each chapter's highlighted word, immediately you will be able to apply new insights, with multiple specific suggestions for clearer views, sharper thinking and other increased performance. To ignite your full engagement, 52 high-performing words are introduced, honored and explored. John Dallas writes arresting, pleasurable and memorable narrative. In stylized, nuanced and evocative ways, John invites you to dig, drill and think deeper so you will reach, climb and soar higher. From the author's Language for Leading, the book’s 52 high-impact selections — called by some readers "grown-up words for adult leaders of all ages" — yield lasting personal and organizational results. Embracing new definitions, descriptions and destinations for 52 spotlighted words, you will welcome and benefit from: (1) accelerating leadership development, (2) achieving immediate results during meetings, (3) stimulating constructive conversation at home, and (4) intensifying productive self-coaching. For a full year and beyond, you will increase your favorable leadership impact at work, home, or anywhere you want or need to extend and improve your and others' performance. John's interpretation, choice and delivery of words are known to engage, empower and enrich readers who are reachable, teachable, and otherwise able. Readers who hunger and thirst for at least a bit more depth and extra meaning in words are richly rewarded. Appreciative and proactive readers then award five-stars and other accolades to We Need to Have a Word. These words are action. These are words to be. Steady reader feedback is remarkably personal and exceptionally positive. Although the book is intended, written, and carefully designed to be a "weekend reader" — for a full year of building, over each ensuing week, deeper relationships with the weekly chapter's featured word — many readers discover they just can't stop reading. This level of reader engagement is outstanding. Yet allowing oneself a full week to think about and use the featured word is believed to be the preferred way to accrue the greatest value from this reading journey. Some eager souls are choosing to read through the entire book, and then start again to read each chapter on a week-by-week basis. Free digital edition! Immediately you will be sent an e-mail message with the book's PDF version of all core content from the hardcover edition. Before your hardcover book arrives, you can open and enjoy text and graphics in Adobe Reader for computer monitors, Adobe's iBook option for iPads and iPhones, and Adobe tools for other e-reader devices. Occasionally e-mail reminders will be sent with motivational messages, chapter excerpts, and other views and news to use about We Need to Have a Word. Inserts with each book contain special greetings from the author. VIP passes will be offered for book signings, readings, speeches, and other events open to the public. Discount tickets to events will be offered when hosts are charging fees for attendance (when such accommodation can be arranged). Discounts on motivational and engagement products for We Need to Have a Word. Gift certificates to use as employee awards, thank you gifts for customers, and birthday, anniversary, holiday, and other giving. Growing-up in Steelers City Pittsburgh, John Dallas learned the primal strength of words. From teen years through age 23 he was privileged to serve in high-profile leadership posts. In 1973 he was recruited to New York City, then suburban D.C., and now his businesses are in Chicago. Words that are screamed within earshot, intoned from fronts of classrooms, bellowed from pulpits, yelled from sidelines, bestowed from podiums, committed to paper, transmitted via airwaves, digitally rendered, whispered pillow-to-pillow, and shot from both sides of many political mouths, form his deep, abiding, intimate, pivotal, and sometimes awe-inspiring relationships with hundreds or more empowering words. From his Language for Leading he chose for this book 52 words with high potential for igniting in all readers greater appreciation for words as action. Since his earliest years as a front-line leader, John Dallas is known as "a man of his words." Over three decades he served as President of five prior national service companies, and in other leadership roles. Still he picks and chooses words to both ignite and enrich others. John's words are action. John’s words work. For 12 years (1974-1986), in Manhattan he ran an electronic publishing company with the accurate motto: "We do more with your words." John does. 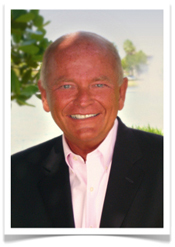 From the start of his career, John is associated with words of many leaders in nearly every field and industry, from his professional involvement with words of U.S. Presidents and Fortune 500 chiefs, to heads of leading professional firms, charities, and small businesses. Driven by an uncanny knack for hearing and seeing nuances in words, John reverses for readers the high risk of simplicity in learning, thinking about, and otherwise using high-performing words. In this book you will experience and embrace 52 high-impact words for your and others' immediate and sustainable success. From the mid-1970s John chose to observe and study intricacy of what he calls Language for Leading. John illustrates and expounds upon professional and personal ways in which fully responsible leaders enjoy and deploy words. We Need to Have a Word emerges as John's clear call to action for new intentionality in how we think about, deliver, and measure our words. For achieving work-life alignment (vs. pop culture's impossible dream of even-weight work-life balance), and for re-envisioning, re-engineering and re-igniting today's highly interactive global economies, John's thoughts and words are called mission-critical. For wherever we work, live, buy or vote, We Need to Have a Word delivers options leaders must keep top-of-mind. Thank you for placing your order for one or more copies. Bulk orders for 25 or more copies qualify for a discount. Orders for 100 or more copies either qualify for a discount, or can include a complimentary video webcast with John Dallas for groups of readers to focus on one or two chapters. With a purchase of 200 or more copies for one organization, a discount is applied, or John Dallas will travel to any location in North America to present to an audience of readers an interactive workshop related to one or two words selected by the host organization. For bulk orders from 25 copies upward, prevailing discounts will be refunded through PayPal. Out-of-pocket expenses for travel, meals and materials are underwritten at-cost by host organizations. Organizational sponsorships for book tours, signings and readings are available. Media inquiries are encouraged for interviews and weekly serialization of excerpts from chapters in the book. Please call 312.643.8000 for additional information. Thank you for ordering signed copies of We Need to Have a Word.